With the Polish law about the memory of the Holocaust garnering uproar, along with the growing debate of the legality of circumcision and kosher slaughter in northern European countries, last week about 50 rabbis and their wives currently serving in European Jewish communities through the Straus-Amiel Institute gathered in Zurich to discuss the building of the Jewish community. 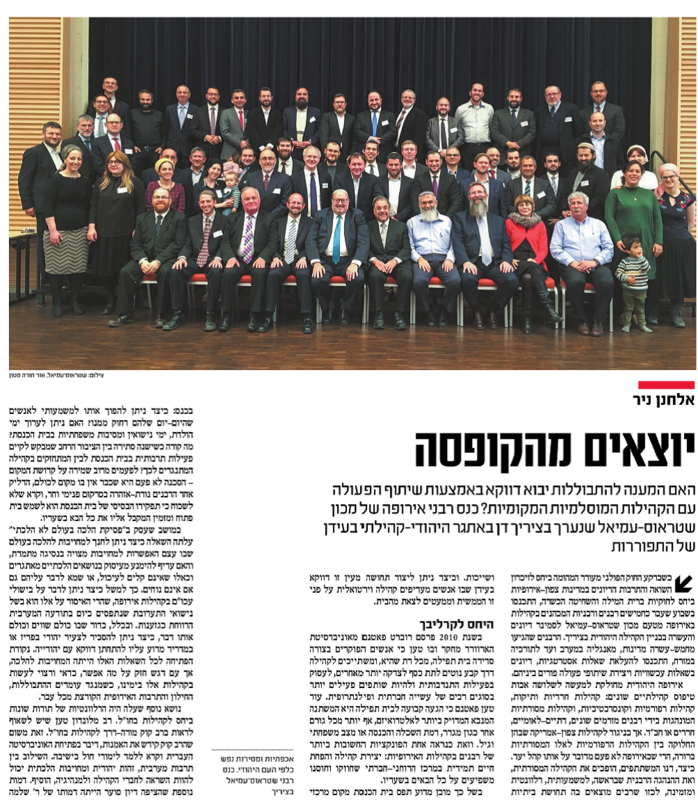 The rabbis, hailing from 15 countries ranging from the UK in the west to Turkey in the east, came together to debate current questions, discuss strategy and to exchange information with each other. Jewish communities in Europe can be divided into three types: old and established Haredi communities; Reform and Conservative communities; and traditional communities led by a range of rabbis – modern Orthodox, Haredi or Chabad. But unlike North America where the division between the traditional and Reform communities is very clear, in Europe these communities often serve the same target audience. The participants at the conference discussed how to make the traditional community (and the rabbi at its helm) meaningful, relevant and inviting, so that different types of Jews feel a sense of comfort and belonging within it. This is particularly challenging at a time where many people prefer virtual communities over actual physical communities. In 2010, Robert Putnam of Harvard published a study where he claimed that people who regularly attend a place of worship and belong to a community tend to contribute more money to charity, to volunteer and to be more active in many types of social and philanthropic activity. Putnam also claimed that regularly attending prayers is the variable which most accurately predicts altruism, over all other variables such as gender, education, income, personal status or age. This also appears to be one of the most important roles of the rabbi in European communities: creating a community and infusing life into the spiritual-social center which has been shown to have a great impact on its members. With this in mind, it is understandable that the place of the synagogue was a main topic of discussion at the conference: how can it be a meaningful place for people whose daily lives are far from it? Can birthday parties, anniversary parties or other family parties be held at the synagogue? What happens when there is a disagreement between the larger community and the more religious members about holding cultural events at the synagogue? Sometimes we are so concerned with the sanctity of the synagogue, that we forget that the basic function of the synagogue is to be an open and inviting place to all visitors. A panel discussion about “halakhic rulings in a world not ruled by halakha” raised the question of how to educate towards commitment to halakha, and whether it is better to avoid the discussion of challenging or upsetting halakhic topics, or whether they must be discussed even when it is uncomfortable. An example is the discussion of bishul akum (food cooked by a non-Jew) in European communities – since the prohibition was established in order to avoid intermarriage, a prohibition which is largely seen as racism in today’s Western consciousness. In general, in a generation where everyone is seen as equal, how can you explain to a young man in Paris or Madrid that he must marry a Jew? The underlying assumption in all of these questions was the commitment to halakha, but with a strong emphasis on what is possible to do and what should be done in these communities today, when we are confronted with intermarriage, secularism and European culture everywhere we look. Another topic that came up was the relevance of different ideologies to communities in the Diaspora. A rabbi from London claimed that Rav Kook should be a central figure to emphasize in Diaspora communities. This is because Rav Kook valued art, spoke at the opening ceremony of the Hebrew University and even suggested the study of secular studies at yeshiva. He added that the strong ties between Western culture and Jewish identity and commitment to halakha which exist in Rav Kook’s ideology can serve as an inspiration to members and leaders of the community alike. Another figure who prompted a vigorous discussion was Rabbi Shlomo Carlebach and the allegations of his sexual misconduct. Can he be seen as a role model or a spiritual leader in Jewish communities? This also raised the question of whether unproven rumors should render a person who served the Jewish community with great dedication for so many years a persona non grata. It was only on the last day of the conference that the most heated discussions about the explosive topic of intermarriage came up. After the screening of the movie “Ne’elamim” (Disappearing), which was produced a few years ago by the Ministry of Diaspora Affairs to show the rising rates of intermarriage in the Diaspora, there were rabbis who expressed resentment about the dramatization and the scare tactics about the rising percentages of intermarriage, and about the common Israeli phrase describing the phenomenon – “a silent Holocaust.” Instead of talking about Judaism, let’s talk about the Jew, one participant said. Instead of seeing intermarriage as automatically causing assimilation and cutting one off from the Jewish people, we must try to separate between the two; there are Jews who leave Judaism and assimilate even without marrying non-Jews, and there are those who intermarry but hold on to their active Jewish identity and are very far from assimilation. Rabbi Yehiel Wasserman, head of the Center for Religious Affairs in the Diaspora in the World Zionist Organization, who participated in the conference, mentioned the Netziv of Volozhin’s observation that the verse “a nation that dwells alone” (Numbers 23:9) is not a promise but a challenge. The dwindling of the Jewish people was also common in the Middle Ages, and is not a new phenomenon. However, he added, we must move past these bleak estimations and continue our spiritual and communal activity. On the other hand, a rabbi in Munich claimed that we must admit that most of the small communities have no chance outside of Israel, as “we won’t be able to maintain these communities over time. We are trying to save whatever we can.” But his words caused discomfort among the participants. Others responded that currently, when Aliyah from Europe is very limited, and many Jewish families move within Europe but do not move to Israel, we must strengthen the communities in the Diaspora and at times even rebuild them. They argued that we must not see Aliyah as the only measure of success, and Israel as the only option. Rav Yitzhak Asiel, the chief rabbi of Serbia, spoke about a weekly televised meeting that he has been having with the Mufti and the Orthodox (Christian) priest in Belgrade for the past three years. In these meetings they discuss topics such as technology and nanotechnology, domestic violence, religious attitudes to Jerusalem and Hebron, the afterlife and the meaning of free choice. He also founded a “verse of the day” project where he presents a short Jewish idea on television, alongside imams and priests who share thoughts from their religions as well. He has been doing this for over a decade. Rabbi Eliahu Birnbaum, founding director of the Straus-Amiel institute, defined one of the main questions at the beginning of the conference as: “How can we ensure the future and identity of the Jewish people? We must always ask why one should be a Jew in London and Paris, Belgrade and Sofia, Warsaw and Istanbul – and what is the meaning of this Judaism?” The discussions throughout the conference all attempted to address this question. As opposed to the many cases of distressing statements by rabbis here in Israel this winter, I was amazed by the relevance of the rabbis in Europe, and their deep understanding of the complexities their congregants are facing, as well as their dedication to the Jewish people. The long days were an attempt to engage in dialogue about the big questions that were raised at the conference. At the end of the conference, each rabbi returned to his community, along with plenty of new ideas and tools to help with his daily work. On my way back to Israel I reflected on the vast difference between the struggle of being a minority in a place where you are challenged merely by virtue of being so few among so many, as opposed to our struggle here, where we are the majority, and the minority is the ultimate “other.” This strengthened my opinion that we must approach others with humility and create windows of true encounter – even more in our situation.